Since the death of Steve Jobs earlier this week we've seen all manner of spontaneous Apple store tributes and testimonials from many of his peers and competitors. But now in the next phase of memoriam, one group has delivered what may be the most perfect Jobs portrait ever. 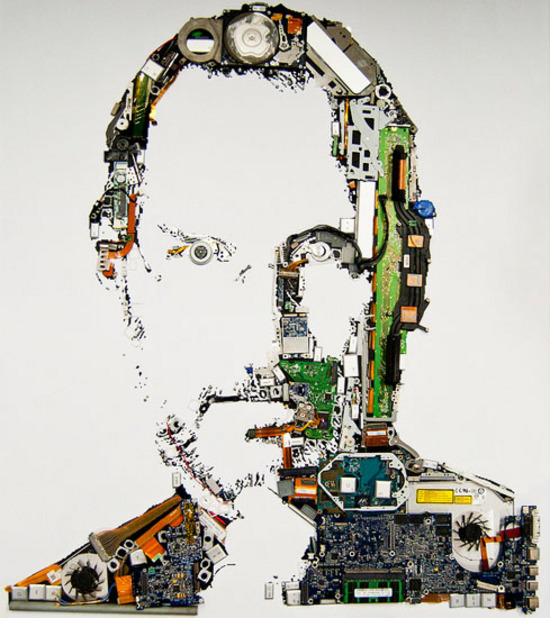 Created by Mint Foundry, the research team at London and New York based firm Mint Digital, the portrait is actually made of a disassembled MacBook Pro. According to the team, the project began quite innocently as a search for spare parts. "It was an incredibly humbling experience. Beyond the smooth sheen of its outer casing, lies one of the most beautifully set out assemblage of components I have ever seen. It's hard to imagine the amount of detail, concentration and obsession that must go into the creation of one of these machines. To be honest, I always thought Mac's were a bit overpriced for what they were. Not anymore... It seemed fitting to create a tribute to him using the spare components of the old MacBook Pro." You can see a larger, more detailed version of the portrait here.